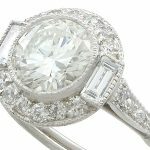 Here at AC Silver, we have a remarkable collection of antique, vintage and contemporary engagement rings. Many of our spectacular rings feature solitaire diamonds, trilogy diamonds and clusters, as well as incorporating gemstones for those who are looking for something a bit more colourful. With Valentine’s Day approaching, we have decided to compile a selection of our finest and most affordable engagement rings. 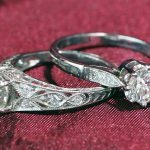 If you’re looking to put some more money toward the wedding itself, or simply can’t wait any longer to pop the question to the woman you love then this is the post for you as these beautiful rings all come in under £2000, and are no less amazing for it! We’ve even featured some of the largest diamonds we offer within this price bracket, just to make sure you get the most diamond for your money! This ring is one of our most spectacular, particularly for the price tag (£1,495). 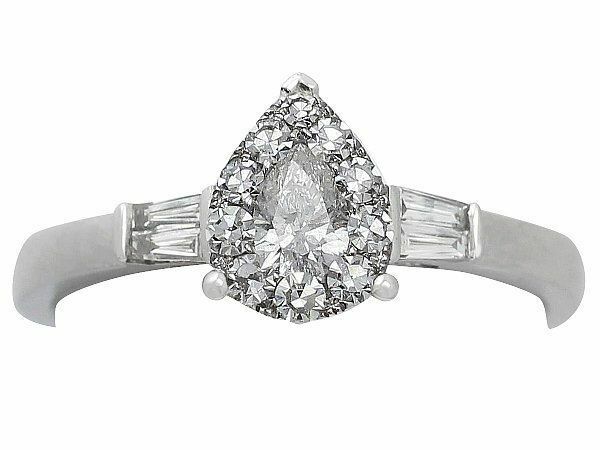 This pear shaped diamond is a highly sought after cut, and has recently become increasingly popular with celebrities. Not only does this ring feature the impressive pear shaped diamond – which already separates it from most engagement rings- while still maintaining a traditional look, but it also incorporates the halo setting (where smaller diamonds surround the central diamond). The benefit of this style is that the smaller, surrounding diamonds help to give the impression of a much larger central diamond. The accenting diamonds on the shoulders also add to the large carat weight of this ring, making it both a magnificent engagement ring and fantastic value for money. This unusual marquise cut diamond solitaire ring is a wonderful choice for any bride-to-be who likes to stand out from the crowd. The ring features a diamond in the fashionable marquise cut. If you feel that she’d prefer something particularly unique, then this style may be the one to go for! 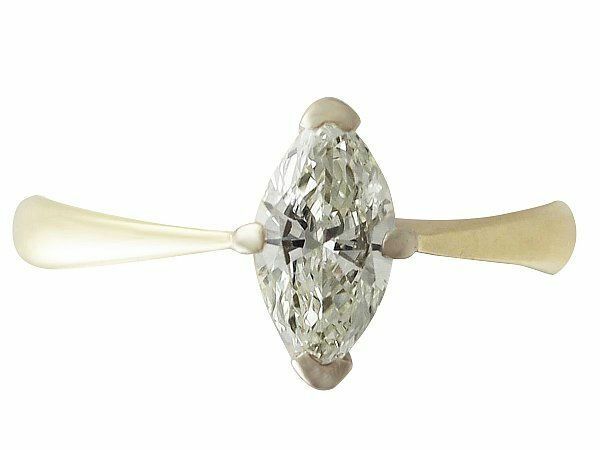 The marquise cut diamond is also extremely flattering on the hand as the elongated shape gives the impression of longer, slimmer fingers. All of these perks for only £1,495! 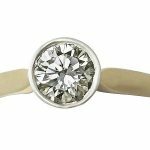 This fantastic ring incorporates two very popular styles: the large central solitaire stone, alongside an eternity band style shank and setting. The abundance of diamonds here means that this ring looks more than worthy of the £1,995 price tag. 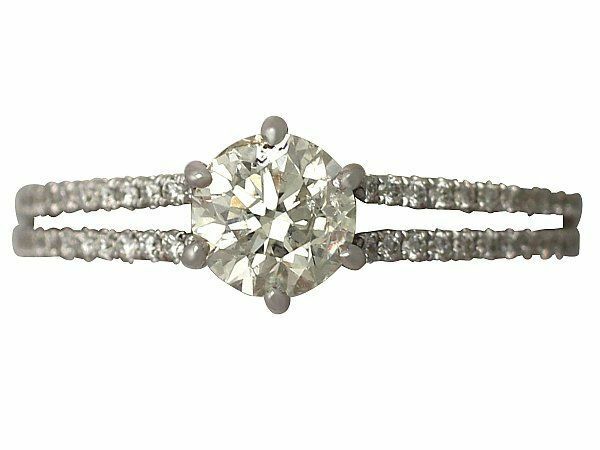 Combining the solitaire style with the traditional eternity ring shank and band makes this ring perfect for a fiancée who likes a combination of classic and contemporary styles. Trilogy rings are a truly classic style choice for an engagement ring. The three stones of the trilogy ring traditionally symbolise the past, the present and the future of a relationship. 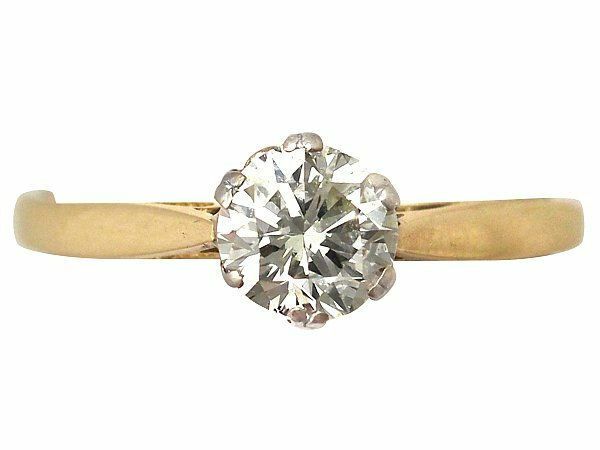 These rings have been a popular choice of engagement rings throughout the nineteenth and twentieth century; their appeal has certainly withstood the test of time. Some prefer the trilogy style as the diamonds and gemstones spread further across the finger, resulting in a flattering effect on the finger. This particular ring benefits from a stunning central sapphire. 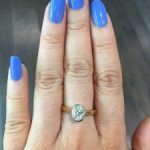 Incorporating gemstones in engagement rings is a wonderful choice for any woman who loves colour, or has an affection for a particular gem for personal or sentimental reasons – for example her birthstone. This fabulous piece is priced at £1,595. This ring displays a quintessentially classic and traditional large round diamond solitaire style. It features a large carat weight diamond, but without a high price tag (£1,995)! 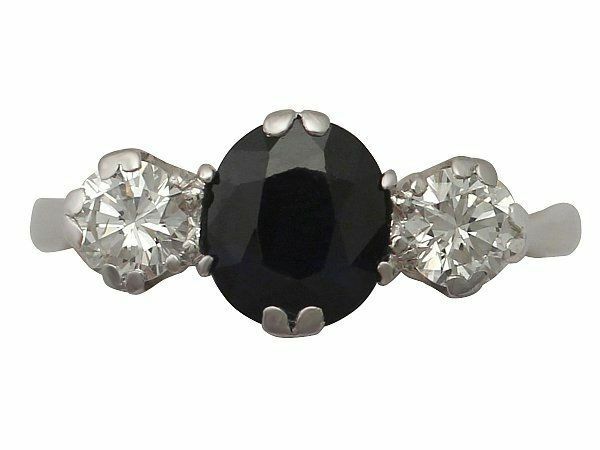 If your beloved is a woman who appreciates chic and elegant jewellery, this ring is the perfect choice. The simplicity of this style and the beauty of the diamond standing alone is sure to make her say “YES!” the moment that she sees the ring! Previous Entry: This Month’s Item of Interest!